GeoEngineers’ Principal Geotechnical Engineer Charlie L. Eustis, PE is a double honoree at the state and local level for the American Society of Civil Engineers (ASCE) in Louisiana. 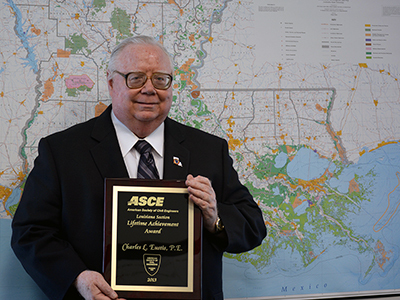 Eustis, who received a 2013 Lifetime Achievement Award in July from the ASCE Baton Rouge Branch, received the same honor from the ASCE Louisiana Section at a ceremony on September 20. This is the second time Eustis is a double honoree for ASCE, previously receiving the 2009 Outstanding Civil Engineer awards from both ASCE’s Baton Rouge Chapter and Louisiana Section. Eustis has worked for 29 years with GeoEngineers and its predecessor company, Louis J. Capozzoli & Associates (LJC&A), in Baton Rouge, earning national recognition for his coastal restoration and shoreline protection engineering expertise. Starting as an active student member of the ASCE in the early 1970s, Eustis continued his involvement by working on several committees and holding every office within the Baton Rouge Branch. He has also served as president and board member of the ASCE Louisiana Section, receiving the ASCE President’s Medal in 2009 for his work on the board.